The failing ANC governed Chris Hani District municipality and Inxuba Yethemba local Municipality have forgotten that they are there to serve the people, all while simply ignoring calls for assistance. This is evident from looming bulk power supply interruptions scheduled for these municipalities from next week, which could be the final nail in the coffin for the many small towns under their control. I will be writing to the Co-operative Governance and Traditional Affairs MEC, Fikile Xasa, to ask that he urgently intervene to prevent these power cuts from taking place. Four more than four years residents of Cradock have had to deal with raw sewerage spilling into their streets, running through their homes and into the Fish River. Middelburg residents have been forced to endure summers without water, with no support at all from the municipality. Stray animals roam free through both towns, and their infrastructure is deteriorating. A recent video showing raw sewage gushes out of the Cradock sewerage system and into the Fish River. Now the situation has grown even more dire, as Eskom steps up plans to interrupt bulk electricity supplies in the area from next week. The proposed cuts are due to the non-payment to Eskom by the municipality, even though the residents have paid the municipality for the electricity they have used. Civil society organisations such as the ratepayers and business forums of Cradock and Middleburg have been up in arms for years and are at their wits end. Businesses are closing, jobs are being shed. For many, the proposed power cuts will be the final nail in the coffin. I have been championing the people’s concerns from as far back as 2014, trying to get the ANC government to deal with the problem. 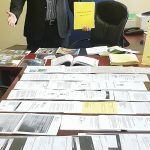 Four years of letters to MECs and Ministers, parliamentary questions, community petitions, reports and media releases, to get these issues attended to. DA MPL Kobus Botha with the reams of paperwork generated trying to get the issues addressed in Cradock and Middelburg. On the rare occasion that responses are forthcoming, promises are made but with no follow through. There is simply no political will within the failing ANC to actually serve the people of this province. I will continue the fight and will not allow the ANC to turn a deaf ear to the plight of the people of this province! The Democratic Alliance believes that the municipalities must be held to account, but not at the expense of the people. We will also request full disclosure of Eskom accounts in all affected municipalities, with a comparison between customer usage, payment of accounts and collection of outstanding accounts. A DA-led government is committed to improving service delivery to the people and has a plan that will turn service delivery around for these towns, from basic services such as deploying water tankers to assist communities when water runs dry, to long term infrastructure projects to address the failing sewerage infrastructure.